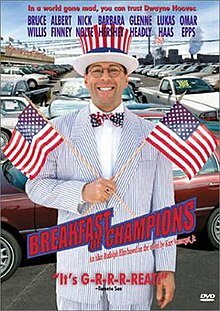 Breakfast of Champions is a 1999 American satirical black comedy film adapted and directed by Alan Rudolph, from Kurt Vonnegut, Jr.'s 1973 novel of the same name. Though the producers entered it into the 49th Berlin International Film Festival, the film was panned by critics and was a box office bomb that was withdrawn from theatres before going into wide release. Dwayne Hoover, a car salesman who is the most respected businessman in Midland City, Indiana, is on the verge of a nervous breakdown, even attempting suicide daily. His wife, Celia, is addicted to pills, and his sales manager and best friend, Harry Le Sabre, is preoccupied with his own secret fondness for wearing lingerie, worried he will be discovered. Meanwhile, a little-known science fiction author, Kilgore Trout, is hitchhiking across the United States to speak at Midland City's arts festival. In search of answers for his identity quest, Hoover decides to attend the festival. Lukas Haas makes a cameo as Bunny, Dwayne's son, who, in the novel, plays piano in the lounge at the Holiday Inn. For legal reasons, in the film Bunny instead plays at the AmeriTel Inn. The film's soundtrack predominantly features the exotica recordings of Martin Denny to tie in with Hoover's Hawaiian-based sales promotion. Much of the film was shot in and around Twin Falls, Idaho. Kurt Vonnegut, Jr. makes a one-line cameo as a TV commercial director. The film made $178,278 against a budget of $12 million. Breakfast of Champions received negative reviews, scoring a rating of 26% on Rotten Tomatoes based on 47 reviews. The consensus says: "The movie is overwhelmed by its chaotic visual effects and disjointed storyline." In his review for The New York Times, Stephen Holden wrote, "In many ways, Breakfast of Champions is an incoherent mess. But it never compromises its zany vision of the country as a demented junkyard wonderland in which we are all strangers groping for a hand to guide us through the looking glass into an unsullied tropical paradise of eternal bliss." Entertainment Weekly gave the film an "F" rating and Owen Gleiberman wrote, "Rudolph, in an act of insane folly, seems to think that what matters is the story. The result could almost be his version of a Robert Altman disaster — a movie so unhinged it practically dares you not to hate it." In his review for the San Francisco Chronicle, Peter Stack wrote, "Rudolph botches the material big time. Relying on lame visual gimmicks that fall flat, and insisting on pushing almost every scene as frantic comedy weighted by social commentary, he forces his actors to become hams rather than believable characters." Sight and Sound magazine's Edward Lawrenson wrote, "Willis' performance, all madness, no method, soon feels embarrassingly indulgent." In his review for the Los Angeles Times, Kevin Thomas wrote, "As it is, Breakfast of Champions is too in-your-face, too heavily satirical in its look, and its ideas not as fresh as they should be. For the film to have grabbed us from the start, Rudolph needed to make a sharper differentiation between the everyday world his people live in and the vivid world of their tormented imaginations." In her review for the Village Voice, Amy Taubin wrote, "Another middle-aged male-crisis opus, it begins on a note of total migraine-inducing hysteria, which continues unabated throughout." The French filmmaker and critic Luc Moullet, on the other hand, regarded it as one of the greatest films of the 1990s. At the close of the Harper Audiobook edition of Breakfast of Champions, there is brief conversation between Vonnegut and his long-time friend and attorney, Donald C. Farber, in which the two, among making jokes, disparage this loose film adaptation of the book as "painful to watch." ^ "Berlinale: 1999 Programme". Berlinale.de. Retrieved 2012-01-29. ^ "Breakfast of Champions makes an impression". Ew.com. Retrieved 3 January 2018. ^ "It's a decade since Twin Falls' last picture show". Magicvalley.com. Retrieved 3 January 2018. ^ "Breakfast of Champions". Rotten Tomatoes. Retrieved 2009-07-23. ^ Holden, Stephen (September 17, 1999). "The Affluent Society? Welcome to the Fun House". The New York Times. Retrieved 2009-07-23. ^ Gleiberman, Owen (September 24, 1999). "Breakfast of Champions". Entertainment Weekly. Retrieved 2009-07-23. ^ Stack, Peter (December 10, 1999). "Way Too Much Ham In Overdone Breakfast". San Francisco Chronicle. Retrieved 2009-07-23. ^ Lawrenson, Edward (September 2000). "Breakfast of Champions". Sight and Sound. Archived from the original on 2009-06-30. Retrieved 2009-07-23. ^ Thomas, Kevin (September 17, 1999). "Breakfast of Champions". Los Angeles Times. Retrieved 2012-02-28. ^ Taubin, Amy (September 21, 1999). "Sticky-Sweet Hereafters". Village Voice. Retrieved 2009-07-23. ^ "Howling Wretches". Howlingwretches.blogspot.de. Retrieved 3 January 2018. ^ Vonnegut, Kurt Jr. "Breakfast of Champions" (CD Unabridged ed.). HarperCollins.